The “trash man” driving a green truck drives right up next to our trash can, an electronic arm comes out and hugs the large, green trash cans (with wheels) and hoists it over the side of the truck and dumps out the contents. In one fluid motion the large green trash can (with wheels) is gently placed back to it original location. 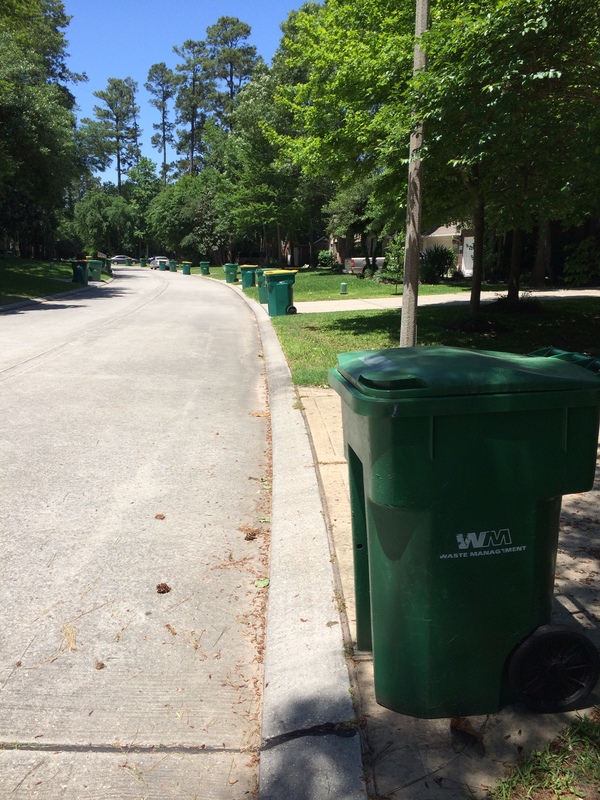 A very smooth, simple and slick operation in dealing with our trash. No comments. No judgment. No comparison to other people’s trash. One fluid motion and my trash is gone! Except this past Tuesday, something totally out of the ordinary routine took place. If I hadn’t been outside watching this take place firsthand, I wouldn’t have believe a word of it. Trash cans line the curb (see photo above) awaiting the hug of an electronic arm (the only hug these cans get all week!!). But, the other day there was a man in gray coveralls walking ahead of the truck. His gray beard matched his gray coveralls and his stern look was quite the opposite of what these trash cans with wheels were used to. He approached each can with a disgusted look and with much force ripped open each can, tossing back the lid of each can with such force that each can teetered and tottered! The walking trash man leaned in and over and started sorting through the trash. With no regard for any environmental concerns he started throwing trash over each neighbor’s respective lawn. I couldn’t believe my eyes. As I looked down the street from whence this walking trash man came all the freshly mowed lawns were literally littered with trash! When he got to my house, I quickly stepped outside to stop this barrage of garbage flinging! “Hey! What are you doing?” was my loud call. “What does it look like I’m doing?” was his sarcastic reply. I was stunned, silent and steaming! My attempt at dialogue was met with contempt, anger and disregard. After about ten minutes of this ridiculousness, he moved on to the next house to continue the carnage. As you have figured out by now, this did not really happen. Can you imagine if it really did!!!? Wow! We have a trash man whose name is Jesus. Not just on Tuesday, but rather on every day of the week that ends in “Y”, the Trash Man comes to the home of our hearts and empties the trash. Here is the marvelous news! Jesus’ loving arms hug our trash cans and empties the trash can of our sins, our faults, our mistakes, our mess ups. He does not sort out what trash is acceptable and which trash is not acceptable. He does not question what is in our cans. He does not compare my trash with yours or yours with mine. He simply takes that which we offer and disposes of it and remembers it no more. Whether your trash can has wheels or no wheels (mine has four wheels! ), Jesus gently removes the trash without trashing the can. “Hey, hey, hey, put our your can! It’s not every day that someone offers to empty the trash can of our sins, much less someone who empties our trash every day. In Jesus, the Trash Man we find both! Well, I have to admit I have never thought of Jesus as my “trash man”, but I certainly will from now on! And I love the comparison…..and Hallelujah! I am mighty glad He does not sort through my “trash” for all the world to see! I’m so glad Jesus does not sort through my trash and throw it elsewhere for others to see. This was so good, and an entirely new way of looking at emptying myself of my trash! Thanks David, this was great.